ORANGE CITY - The Aruban government has agreed in principle yesterday the oil company Valero for her stay on the island in June strengthened. This last month after both sides signed a memorandum of understanding. Valero also announced yesterday that more money goes to pay arrears bbo, 210 instead of 200 million florin. And for the first property tax of 1.2 million florin will pay after the expiry of the tax holiday this year. amendment still must be by the States. The other agreements that were agreed last month, are maintained. Valero 7 percent each year to pay profit tax, with a minimum of 10 million U.S. dollars, regardless of profit or loss. Should another company take over the refinery later, then that company will pay 15 million U.S. dollars in profits. In total, in any case represents an additional annual 20 million florin in the treasury. The customs have also made arrangements for facilitation of the import rules for the refinery. The job guarantee for employees of Valero remains in force until June 1st. If the refinery after that date are not accepted, then the Government as yet no place for these workers. Premier Mike Eman (AVP), the Minister of Finance, Utilities, Energy and Communications Mike de Meza (AVP and Valero-director Ray Buckley yesterday gave the explanation of arrangements. The Prime Minister is the acquisition of or participation in the refinery more attractive for other carriers. "In the past, potential buyers for the refinery always ask about the BBO and tax regimes. This settlement agreement or plays no role. Valero Aruba and have security." Energy Envoy Meinte-Jan Postma, Netherlands to Aruba who enlisted, was also indirectly involved in the negotiations, confirmed Eman. "Who kept him informed and he gave us advice and feedback." Eman said that Postma, despite the fall of the Balkenende government, involvement in, the quest for new buyers for the refinery. There are still candidates for the search for natural gas on the seabed around Aruba. Nowadays a lot of energy companies searching might show interest in the refinery gas to operate. According to Minister De Meza is offering a package of concessions in the refinery with an option. "It definitely would be. We take into account all possibilities. 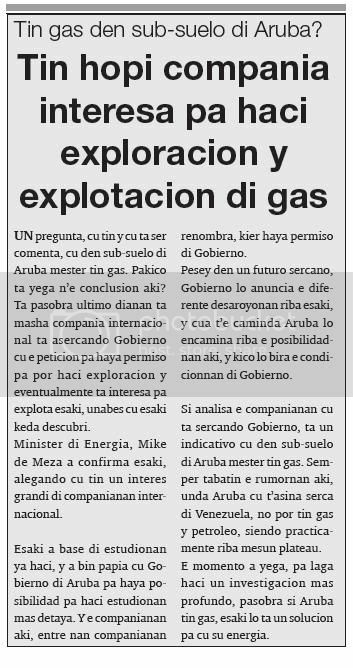 "Eman Premier added, that the finding of gas around Aruba event could have implications for the refinery. "The owner will then have to make adjustments to the refinery to run on gas. That environment would ultimately can relieve a lot. " Great to see you Helen Back! I've been missing you! I should have checked for the translated article first, sorry! ORANJESTAD — The Aruban government has strengthened the basic agreement with oil company Valero yesterday for their stay on the island until June. This took place after both parties had already signed a declaration of intent last month. It was also announced yesterday that Valero will be paying more money towards outstanding bbo, namely 210 instead of 200 million florins, and for the first time, they will be paying land-tax amounting to 1.2 million florins upon expiry of the tax holiday this year. The government confirmed once again yesterday that the bbo on export would definitely be abolished. The government emphasized that the abolishment applies for all export-companies on Aruba. However, the amendment still requires the approval of the States. The other agreements, which had been concluded last month, will also be maintained. Valero will be paying 7 percent tax on profits per year with a minimum of 10 million dollars, depending on profit or loss. If another company were to take over the refinery, this company would have to pay 15 million dollars tax on profits. In any case, this implies a total additional amount of 20 million florins per year for the treasury. Furthermore, agreements were made with the customs to relax the import regulations for the refinery. The employment guarantee for the employees of Valero will remain valid until June 1st. The government will not be able to offer these employees any employment for the time being, if the refinery has not been taken over by that date. Eman confirms that energy giant Meinte-Jan Postma, whom the Netherlands had called in for Aruba, had also been indirectly involved with the negotiations. “We had kept him informed and he had given us advice and feedback.” Eman announced that Postma – in spite of the resignation of the Balkenende-cabinet – would remain involved with the search for new buyers for the refinery. In addition, the island still has the candidates seeking for natural gas in the sea bottom surrounding Aruba. one question, cu have y cu is being comenta, cu in sub-suelo of aruba have to have gas. pakico is arrive n’e conclusion here? is because ultimo dianan is very compania internacional is asercando gobierno cu the peticion for achieve permission for can haci exploracion y eventualmente is interesa for explota this, unabes cu this stay descubri. minister of energy, mike de meza owing to confirma this, alegando cu have one interest big of companianan internacional. this owing to base of estudionan already haci, y owing to come talk cu gobierno of aruba for achieve posibilidad for haci estudionan more detail. y the companianan here, among they companianan renombra, wanted achieve permission of gobierno. pesey in one future sercano, gobierno will anuncia the various desaroyonan on this, y cua t’e caminda aruba will encamina on the posibilidadnan here, y kico will become the condicionnan of gobierno. if analisa the companianan cu is sercando gobierno, is one indicativo cu in sub-suelo of aruba have to have gas. always had the rumornan here, where aruba cu t’asina serca of venezuela, not can have gas y petroleum, siendo practicamente on same plateau. the instant owing to arrive, for let haci one investigacion more deep, because if aruba have gas, this will is one solucion for cu his energy. ORANGE CITY - Minister Mike de Meza (AVP) Finance, Utilities, Energy and Communications is the end of this month in Brazil with representatives from energy company Petrobras talk about a possible acquisition by Valero. The interviews take place with the support of Valero. This was announced during a press conference this morning that Prime Minister Mike Eman (AVP) and the Minister Meza held at the main entrance of the refinery in San Nicolas after a conversation with the supervisor. Meza said the Minister that there are always contacts with the Venezuelan PDVSA, and that Valero is now in talks with the Canadian oil and gas company Pacific Rubiales. "They are currently looking into various scenarios together," said De Meza who once said that if re-establish Valero refinery could start operating again when the economic situation permits. Valero has he also contacted the Mexican oil company Pemex, but indicated no interest in yet. Premier Eman says he leaves Wednesday to the Netherlands. As he consults with the Dutch Minister of Foreign Affairs how it can help in negotiations with Petrobras. In January, State Secretary Ank Bijleveld (CDA) of Kingdom Relations all that the Dutch Ministry of Foreign Affairs had contacted with Petrobras. The Brazilian oil giant in 2008 and 2009 had twice expressed interest in taking over the refinery in San Nicolas. Both times bounced off the takeover, first by a fire in one of the vacuum units of the refinery and then by the decision of the Brazilian oil company for now but continue to invest in their own country. The ministers were also Valero today to discuss the agreement with the government oil company has signed. This agreement was agreed, among others that the BBO-load of 1 percent in exports will be abolished and that the refinery less (7 percent) profits tax to pay. According to Minister De Meza, the bills now in this final form and have it ready just yet to be discussed by parliament. A date for this treatment is still not pinned. Valero has indicated agreement in the salaries of its employees by continuing to pay until June of this year. ORANJESTAD — Minister Mike de Meza (AVP) of Finances, Utilities, Communication and Energy will negotiate with representatives of energy company Petrobas on a possible take-over of Valero at the end of this month in Brazil. Valero supports the negotiations. After a conversation with the management, the aforementioned was announced during a press conference held by Premier Mike Eman (AVP) and Minister De Meza at the main entrance of the refinery in San Nicolas. Minister De Meza states there are still contacts with the Venezuelan PdVSA and that Valero is currently negotiating with the Canadian oil and gas winning company Pacific Rubiales. “They are currently viewing several scenarios,” says De Meza, who indicated once again that Valero might possibly run the refinery again if the economical situation becomes favorable. According to him, Valero has also contacted the Mexican oil company Pemex, but the latter indicated they were not interested for the time being. Premier Eman announced he would be leaving for the Netherlands this Wednesday, where he will be consulting with the Dutch Minister of Foreign Affairs as to how the latter could assist with the negotiations with Petrobas. State-Secretary, Ank Bijleveld (CDA) of Kingdom Relations, had already indicated last January that the Dutch Ministry of Foreign Affairs had contacted Petrobas. The Brazilian oil giant had already expressed its interest twice in 2008 and 2009 in taking over the refinery in San Nicolas. However, the take over had foundered both times, first due to a fire in one of the refinery’s vacuum units, followed by a decision from the Brazilian oil company to rather invest in their own country for the time being. The members of government had also met with Valero today to discuss the agreement, which the government had signed with the oil company. This agreement, amongst others, included the agreed upon abolishment of one-percent bbo-tax on export products and the refinery having to pay less tax on profits (7 percent). According to Minister De Meza, the relevant enactments are currently available in definite form, and only require parliament discussion. However, a date for this discussion has not been fixed yet. In the agreement, Valero indicated they would continue to pay the salaries of their employees until June of this year. ORANGE CITY - Petrobras refinery will not buy, but be interested in cooperation. "That is what the Dutch Foreign Minister Maxime Verhagen (CDA) yesterday by telephone to Prime Minister Mike Eman (AVP) announced. Verhagen is currently with Dutch trade delegation on a visit to Brazil. According to Eman Verhagen has said that Petrobras is open to "other alternatives that could lead to a collaboration between Valero and Petrobras. Eman, noting the possibility of a joint venture. Immediately after the telephone conversation with Eman Verhagen has been Minister of Finance, Utilities, Energy and Communications Mike Meza (AVP) called to him the contents of the call to inform. The prime minister announces that the Meza Valero then a delegation to Brazil with Petrobras is left to continue talking. Prime Minister Eman is pleased with this new opening by Petrobras. He also expressed very positive about the cooperation with the Netherlands in this case. During his recent visit to the Netherlands he had appealed to both Verhagen and the Dutch Minister of Transport Camiel Eurlings (CDA) to an effort to Petrobras again interesting them in the refinery in Aruba. Both Dutch ministers from April 5 to 10 were part of a heavy economic trade mission in Brazil. Besides the ministers are also thirty Dutch companies in the transportation and logistics part of the delegation. Eman had with his Dutch colleagues also called for an opening to find the Meza to join in further talks with Petrobras. The fact that the Meza currently traveling to Brazil, is clear that the Netherlands has succeeded in finding it open. The Prime Minister stressed, finally, that in the current economic times difficult to link the refinery a good solution. "But we continue to do everything and we are investigating, along with the Netherlands, all possibilities." Not sure how much (if any) of this is true, but thought some of the information was interesting. Recently, the newspaper wrote that President Chávez Nobo during a state visit to Ecuador reported that only one gas field on the Caribbean coast of Venezuela near Falcon (Paraguaná Peninsula) was detected with a capacity of 14 trillion cubic feet. This discovery is part of a strategic project under the name of Rafael Urdaneta. Meanwhile, Petroleos de Venezuela (PDVSA) in collaboration with various multinational companies engaged in exploration and exploitation of a number of gas fields around the Paraguaná Peninsula. We're talking about wells, each containing thousands of billions of cubic feet of natural gas. This project was launched in 2005. The Rafael Urdaneta project begins in the Gulf of Venezuela (is an extension of the Gulf of Maracaibo) between Colombia and Paraguaná and continues around the peninsula to the east. This project is bounded to the north through the territorial waters of the Caribbean colony. To the east are other natural gas projects. One area is shared by Venezuela and Trinidad & Tobago. Both countries have agreed a formula with regard to this common area. It will be every sane and sensible person understood that the gas fields, within the present project, extend beyond the territorial waters of the Caribbean. With the necessary persistence in the past we have always emphasized the strategic economic and financial importance for the Netherlands Antilles that the mean natural gas and oil in our territorial waters by occupied the Netherlands. 1. These findings demonstrate the economic potential of the Antilles. A practical and pragmatic reason for short term gain independence (including Aruba, Bonaire, St. Maarten, Saba and St. Eustatius). 2. These findings provide practical evidence that the economic independence of the Antilles is real. 3. If we continue to colonial occupation, we will be missing out. Because we are busy colonial and colonial document Statute stipulates that negotiations with Venezuela to a Dutch affair, the Netherlands will make every effort to fully master this issue and are pulling. Foreign relations are a known concern of the Kingdom, so the Netherlands. Until it does, the Netherlands will have the proceeds of what legitimately belongs to us go off. The Netherlands is even planning to soon its colonial occupation forces (Navy and Air Force) to drastically increase! 4. The agreement between Venezuela and Trinidad shows that there is no fraud or theft of Venezuelan side, but a business arrangement in which property rights are the sources of both parties are respected. 5. So there is no reason to think the Venezuelan Antilles cheat or threaten to commodities or other things. This refutes any argument for the so-called protection of the Netherlands to maintain. The opposite is true true. Netherlands is the occupier, oppressor and exploiter. Netherlands is fully aware of the enormous economic potential of natural gas fields (and oil deposits) in our territorial waters. The annexation of the BES (especially Bonaire) is directly related to this, given the decline in natural gas reserves in Europe. The said military mobilization is aimed at our treasures for the Netherlands to safeguard and again to steal what our historical and legitimate due. These need to our current political elite are aware, instead of themselves subservient and submissive to the colonial occupier and Suppressor in to establish and continually squander our national interest to the colonial occupier and exploiter. Our national interest means specifically the immediate start of negotiations with the Netherlands to achieve recognition of our independence, the restoration of our sovereignty and national dignity, Dutch bond for four hundred years occupation, oppression and exploitation and payment of adequate compensation from the State of the Netherlands. Only then will we be able to be independent and sovereign to decide on what we historically and rightfully. Only independent and sovereign, we are able to determine with whom we do business to develop out of our territorial waters, our land, our strategic raw materials, our biodiversity, only in the service of our national economic interest. Even with the Netherlands, cases will be done, but under our conditions. The entrance to the parking garage of the Brazilian oil company Petrobras. ORANGE CITY / RIO DE JANEIRO - Petrobras and Valero have as yet no deal can close. The Brazilian oil company, the doors to cooperation with Valero still be open. It says the Minister of Finance, Utilities, Energy and Communications Mike Meza (AVP). An Aruban delegation left last week to Brazil with Petrobras to negotiate a possible joint venture. Their trip was in response to an earlier visit by the Dutch Foreign Minister Maxime Verhagen (CDA) in Brazil. He was in April for a trade mission in Brazil and was premier Mike Eman (AVP) after announced that Petrobras was interested in a possible Jonte venture. The Aruban delegation traveled alongside the Minister Meza, his adviser Hoevertzs Frank, a lawyer-Fat and John Sjiem ASF member of the States Donny Rasmijn them. They gave Petrobras several options for cooperation. As a long-term oil purchase agreement, the co-operation of the refinery or processing of oil at a special rate. Petrobras itself provided all offers commentary and Valero requested to submit offers to continue. But according to The Meza, the Brazilian oil company again very clearly indicated that the market is still too tight. The Meza was also told that Petrobras has no interest in buying the refinery. Since the crisis, the Brazilian oil company primarily engaged in investing in their own country. The Aruban government is desperately looking for candidates for a possible takeover of the refinery joint venture van met Valero, which the June 1 job guarantee of its staff at the refinery in San Nicolas vast houdt. Currently, the Venezuelan state oil company PDVSA and the Canadian Pacific Rubiales still image. According Rasmijn member of the States are the other times in the year 2010 than in September 2008, when Brazil had a large amount of heavy oil without a place to export. When the negotiations between Petrobras and Valero at one point went afketsten Petrobras with its oil to China. Rasmijn believes that Aruba has missed an opportunity at that time. The government then focused more on him in the recovery of PDO instead of keeping open the refinery. "But Petrobras is now engaged in explorations. If there an extra supply of heavy oil are released, it would just be that Aruba are eligible. " SAN ANTONIO, April 29 (Reuters) - Leading independent U.S.
Bill Klesse at the company's annual meeting on Thursday. that are committed to Valero, you're getting into a $4 market,"
production of diesel fuels from crude oil. would be a hedge on the future." refinery or resume production, he has said. ORANJESTAD— News out of Brazil was not encouraging. Minister of Finance and Utilities Mike de Meza returned from the South American powerhouse without a clear commitment of Petrobras to help rescue the Aruba Refinery. Valero, operator of the refinery, has given the government assurance it will keep on its personnel until June. But without a clear solution for Valero’s problems of running the refinery here without huge losses, the survival options are becoming less. Minister de Meza went on a fact finding mission to Brazil, to discuss a possible joint venture between the national petroleum company, Petrobras and Valero. The meetings, arranged by the Dutch government, were cordial, but did not yield the results of a cooperation agreement between the two companies that would ensure the continuance of the refinery. Petrobras offered to review the possibility based on the results of the elections in Brazil in October, yet, Valero has not given any indication it would be willing to wait that long. Moreover, the business of refining worldwide is under pressure, as demand for oil derivatives have shrunk considerably. Venezuela’s Secretary of Energy Georgina Kessel Martinez in fact that the prognosis is that the world of oil refining could improve as late as 2015. This is not something Valero was hoping for and not information that is positive for the survival of the Aruba refinery, which has been put on idle since last year. Minister Mike de Meza admitted that the market has not improved yet, but refuses to give up on the refinery. He said Valero itself is in communication with the Colombian company Pacific Rubiales Energy. Pacific Rubiales has its own oil sources and is being traded on the Canadian market. It is considered the largest independent exploration and production company of oil and natural gas in Colombia. According to the Minister, Valero is also holding talks on possible joint venture, and is also considering the possibility to purchase oil from Venezuela. The latter is considered positive for the refinery, as it was built to process Venezuelan crude. This crude is heavy and has high sulfur content, and the Valero Refinery has the capability to get the maximum use out of this product. Meanwhile, the clock is ticking and it is not clear what Valero would do in June. Parliament has yet to approve modification in the legal status of the refinery which would make it more attractive for selling. The refinery until it’s shut down in July of 2009, was good for 12 percent of the Gross Domestic Product of Aruba. Nikolas KozloffAuthor, "Revolution! South America and the Rise of the New Left"
Though undoubtedly shocking and disconcerting, the recent BP oil spill in the Gulf of Mexico is hardly the first incident of its kind in the region. Indeed, as I watched the footage of the ominous oil spill approaching the ecologically sensitive coast of Louisiana, I was struck with a profound sense of déjà vu. Long ago, while researching my dissertation on the environmental history of the petroleum industry in Venezuela, I combed through archives and libraries in the U.S., Britain and South America to uncover the oil companies' sordid past. Starting in the 1920s, American and British subsidiaries of Standard Oil of New Jersey, Gulf and Royal Dutch Shell turned environmentally pristine Lake Maracaibo, which empties out into the Gulf of Venezuela and the Caribbean, into toxic sludge. Travel to Lake Maracaibo today and you can still see the relics of the pioneering petroleum past: hundreds of offshore oil derricks dot the horizon as far as the eye can see. During the 1920s oil was a messy business and blow-outs, fires and fantastic gushers were a common occurrence. Just as in Louisiana today, the oil industry in Lake Maracaibo put delicate lakeshore mangroves in danger as well as tropical wildlife. The water used by local residents for domestic uses came from the lake itself, and reportedly there was little risk of getting sick from the water as it was clean, such that one could even see the head of a coin or a needle in the water. With the arrival of the oil companies however, the water became dirty. In an effort to get control over the burgeoning oil industry, including marine operations, derricks, platforms, tugboats and other infrastructure, the authorities obliged the companies to adopt a system of safety lighting within the lake. The legal moves came none too soon: tankers, each carrying between 15,000 and 25,000 barrels of oil, could make up to ten round trips per month between Lake Maracaibo and refineries on Curacao and Aruba. Even after government officials sought to make lake transport safer, serious accidents occurred. In 1931, for example, an oil schooner was lost in the entrance of Lake Maracaibo. Offshore oil operations meanwhile were vulnerable to fire, as boiler stations with boardwalks connected the oil wells. Each well was in turn flanked by other kinds of oil infrastructure, including platforms holding pumps, mud tanks, pipe racks, manifolds, flow stations and separator or transformer tanks. Obviously, such oil infrastructure posed an enormous environmental threat. In 1927, an oil well blew out with such force that the drilling tower was ripped from its supports. Reportedly, at least 20,000 barrels of oil were spread out over the lake as a result of the blow-out. Over time, a kind of system of environmental racism emerged on the oil fields. While the corporate elite lived in comfortable and hygienic lakeshore housing, Venezuelans, Caribbean blacks, Chinese and other foreigners resided in unsafe villages built on stilts within the lakeshore itself. One such traditional village, Lagunillas, became a disaster waiting to happen. Writing in the late 1920s, one U.S. diplomat remarked "the waters are covered with oil which is carried up to shore by the waves and blackens all vegetation which it touches. Along the shore are rows of palm trees whose leaves are so covered in oil that they droop to the ground. Oil is spattered everywhere on the vegetation and houses. It is carried into the offices and dwellings on the shoes or the clothes of those who enter." Soon enough, the entire town paid the price for oil company negligence when a huge fire ignited Lagunillas. Reportedly, the conflagration was started by a spark from one of the open hearth fires that ignited oil spilled by a leaky drill near Lagunillas. The 1928 fire destroyed more than 80 percent of the town. One local paper in Maracaibo declared that the Lagunillas fire was of such magnitude that it had no historical precedent within the wider region. Needless to say, oil company offices weren't damaged by the accident as they were located at a secure distance from the water. When oil company managers denied any responsibility for the accident, local residents became embittered. An acclaimed contemporary Venezuelan novelist remarked that the oil industry victimized "inferior races." Industrial science, he argued, was firmly in the hands of Anglo-Saxons who cared little if such inferior races died in furthering technological progress. Though Venezuela eventually became one of the world's primary oil exporters as a result of exploration in Lake Maracaibo, the environment continued to take a beating. A refinery owned by Royal Dutch Shell located on the island of Aruba, which processed Maracaibo crude, was strategically important as it supplied products not only to Britain but also to France. In an effort to cut off oil supplies to the allies, Hitler sent German U-boats into the Caribbean during World War II. In February 1942, the Nazis torpedoed and sank a tanker, sending the boat's oily contents into tropical waters. You'd think that with the cessation of wartime hostilities, environmental protection would have improved in the Gulf and Caribbean. Yet despite public relations hype, the Brits and Americans continued their sorry track record with the expansion of complicated offshore oil operations in the wider Caribbean. While the recent BP oil spill in the Gulf was huge and certainly dramatic, it was hardly the first instance of oil company malfeasance. In 1998 for example, a leaky pipeline belonging to BP gave rise to a spill of about 155,000 gallons of crude oil. The pipeline was connected to an oil platform lying about 100 miles southeast of New Orleans, and reportedly the spill reached the southeastern tip of Louisiana. BP, which merged with Amoco and Arco, continued to play fast and loose with the environment when, in 2002, the company allowed a pipeline to rupture. The spill sent about 90,000 gallons of oil into the Southeast Louisiana coastal area. Then, BP encountered further problems when one of its oil platforms was damaged during Hurricane Katrina and started to leak off the coast of Louisiana. The incident, remarked Oil Daily at the time, cast doubt on BP's safety record "in the wake of pipeline corrosion problems and oil spills in Alaska." In Texas, many have grown to resent BP's lackluster regard for safety and the environment. In 2005, an explosion at a BP refinery in south Houston killed 15 people and injured a whopping 170 -- the worst U.S. industrial accident since 1990. And as recently as early April of this year, an 18,000 gallon spill of crude oil damaged the Delta National Wildlife Refuge. The pipeline belonged to Cypress Pipe Line Company, a joint venture between BP and Chevron. Located at the mouth of the Mississippi River, the Delta National Wildlife Refuge serves as the wintering ground for hundreds of thousands of snow geese, coots and ducks. BP's environmental malfeasance is compounded by other, more long-range problems in the Gulf. Indeed, the export of Venezuelan crude to the U.S. has hardly been risk-free from an environmental perspective. Take, for example, the case of the British tanker Alvenus, which ran aground 11 miles off the coast of Louisiana in July, 1984. When the ship's hull cracked around one of its tanks, 1.4 million gallons of heavy Venezuelan crude was released into the water. An 85-mile long oil slick then polluted beaches around Galveston. Venezuela's Hugo Chávez has railed against the Global North, arguing that affluent nations should scrap the capitalist model in favor of socialism in order to save the environment. Yet Venezuelan state oil company PDVSA has hardly been free of environmental problems. In fact, PDVSA, which was born from nationalization of foreign oil companies in the 1970s, inherited many of the same technical and logistical difficulties which had plagued the petroleum industry from the outset. Recently, a U.S. District Court fined PDVSA subsidiary Citgo $13 million for spilling 53,000 barrels of oil in two Louisiana rivers back in 2006. Citgo pleaded guilty in a Lake Charles district court for "negligently failing to maintain storm water tanks and failing to maintain adequate storm water storage capacity" at a local petroleum refinery. The $13 million fine was the largest ever handed down for a criminal misdemeanor violation of the federal Clean Water Act. In light of PDVSA's not so sterling ecological record, it is rather perverse that Chávez has taken on the role of environmental crusader. Yet, it is unrealistic to expect that Venezuela, which is enmeshed in the oil industry, can move the region away from fossil fuels. It was the British and the Americans, who first pioneered offshore oil technology in Lake Maracaibo some one hundred years ago, who must now pave the way for cleaner technologies in an effort to save the Gulf of Mexico. Failure to act now could give rise to more oil spills of the same magnitude that we saw this week. For more information on the environmental history of oil in Venezuela, see Kozloff's doctoral 2002 dissertation from Oxford University, "Maracaibo Black Gold: Venezuelan Oil and Environment in the Era of Juan Vicente Gómez, 1908-1935," and Nikolas Kozloff, "From Lakeshore Village to Oil Boom Town: Lagunillas under Venezuelan Dictator Juan Vicente Gomez, 1908 - 1935," in Christian Brannstrom (ed. ), Latin American Environmental History. This area and companies have come up in the past. CARACAS, Venezuela (AFP) -- President Hugo Chavez's socialist government signed agreements on Wednesday with US oil giant Chevron and Spain's Repsol worth up to 40 billion dollars to develop reserves in the oil-rich Orinoco Belt region. Under new investment rules approved in 2007, the state-run Petroleos de Venezuela (PDVSA) holds at minimum a 60 percent stake in each Orinoco project. Chevron, which heads a group of companies that includes Impex and Mitsubishi of Japan and Venezuela's Suelopetrol, will be operating in Carabobo Bloc Three, officials said. Repsol, which heads a group that includes the Malaysian oil company Petronas and the Indian companies ONGC, Indian Oil and Oil India, have been assigned the Carabobo Bloc One. Their investment will be "between 15 and 20 billion (dollars) per project, and production will range in each bloc from 400,000 and 480,000 barrels a day," said Energy and Oil Minister Rafael Ramirez, who is also head of PDVSA. For years experts believed that it was too expensive to extract and refine the heavy and extra-heavy oil in the Orinoco Belt, a 55,314 square kilometer (21,360 square mile) region around the Orinoco River. But the drop in light oil reserves and the increase in global oil prices -- currently around 75 dollars a barrel, against 20 dollars a barrel in the 1990s -- has revived interest among foreign investors. Repsol Chairman Antonio Brufau and Ali Moshiri, Chevron’s head of production and exploration for Africa and Latin America, signed the agreement at a ceremony along with Chavez. "We sign these agreements making use of our independence and sovereignty," Chavez said at the ceremony. Projects underway in the Orinoco Belt represent 80 billion dollars in investments, Ramirez said. The Orinoco Belt is projected to produce 4.6 million barrels a day by 2020, boosting overall Venezuelan production the following year to 6.8 million barrels per day, up from the current 3.0 million barrels per day, Ramirez said. Some oil companies, like the US-based ConocoPhilips and Exxon Mobil, left Venezuela after the Chavez administration changed investment rules in 2007 and nationalized their assets. But others, including Cheveron and Repsol, were willing to remain and invest under the new rules. At one point,a person from Carabobo,Venezuela was very interested in Bastibro!Coincidence? Yes, I saw you posted that on the 2nd SM link in my post. Wondering about the location of that rig that sank down there, too, and meant to mention it earlier. This article says the latest sunken rig was in waters near Trinidad & Tobago. CARACAS, Venezuela (AFP) -- Venezuela is maintaining plans for offshore natural gas production despite an accident this week that sank a gas platform off the coast, state-owned Petroleos de Venezuela (PDVSA) said on Friday. "We expect production to begin November 25, 2012 as planned," said Eulogio Del Pino, vice president of exploration and production at PDVSA. "We will bring that gas to the country for consumption in our homes, industries, and the petrochemical industry." Del Pino told state television VTV that drilling is set to take place over the next six months. "The work in the area continues," he said. "We are drilling with other teams. We have a window of about six months to complete drilling. The comments came a day after the Aban Pearl platform sank in the Caribbean Sea, off the coast of eastern Venezuela. The structure belongs to Petromarine Energy Services, based in Singapore, which is a subsidiary of India-based Aban Offshore. All 95 workers were safely evacuated. Del Pino said Aban Offshore has another available platform in the Middle East that will be transferred to Venezuela. The official reiterated that there is no gas leak in the area and the well is sealed. The incident comes just three weeks after the BP-leased Deepwater Horizon oil rig sank into the Gulf of Mexico, unleashing thousands of barrels of crude in what could become the worst oil spill in US history. Venezuela has proven gas reserves of 200 trillion cubic feet (5.66 trillion cubic meters) and the total could reach 400 trillion cubic feet (11.33 billion cubic meters), according to officials. The U.S. Coast Guard is investigating the death of a crewman on a dive support vessel who fell into a Louisiana bayou while the boat was docked. The accident involving the moored boat DSV Sun River happened Jan. 7 in Bayou Boeuf, near Morgan City and the Gulf of Mexico, the Coast Guard said. Albert Simon Jr., 39, of Marksville, La., was killed in the incident, according to a statement from the Assumption Parish Sheriff. The accident was reported at 1519 at a dock in the community of Bayou L'ourse, La. Search-and-rescue teams from Assumption and St. Mary's parishes responded, along with the Coast Guard and the state Department of Wildlife and Fisheries. Assumption Parish deputies located Simon's body about 90 minutes after the accident, the sheriff's statement said. Sun River, built in 1979, is 205 feet long and 44 feet wide and draws 15 feet of water. The vessel is operated by Legacy Offshore LLC of Broussard, La. The company specializes in sub-sea construction services in the Gulf of Mexico, at depths of up to 1,000 feet. The vessel's owner is Trico Marine Assets Inc., according to recent inspection records. Page created in 6.209 seconds with 19 queries.